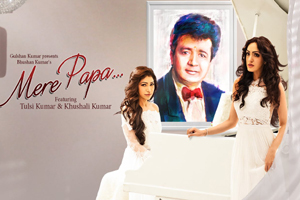 A soulful song beautifully sung by Tulsi Kumar featuring her and Khushali Kumar. Features: Tulsi Kumar, Khushali Kumar. The video of this song is available on YouTube at the official channel T-Series. This video is of 3 minutes 40 seconds duration. Lyrics of "Mere Papa (Tulsi Kumar)"
Lyrics in Hindi (Unicode) of "मेरे पापा"